Save referrer URL: If enabled, the referrer URL will be stored together with the answers. Select the option that suits your needs. For more information on survey participants, access the following link. when the survey is initialized, you can change the text for questions, answers, the survey etc, but not the type of question or the type of answer. 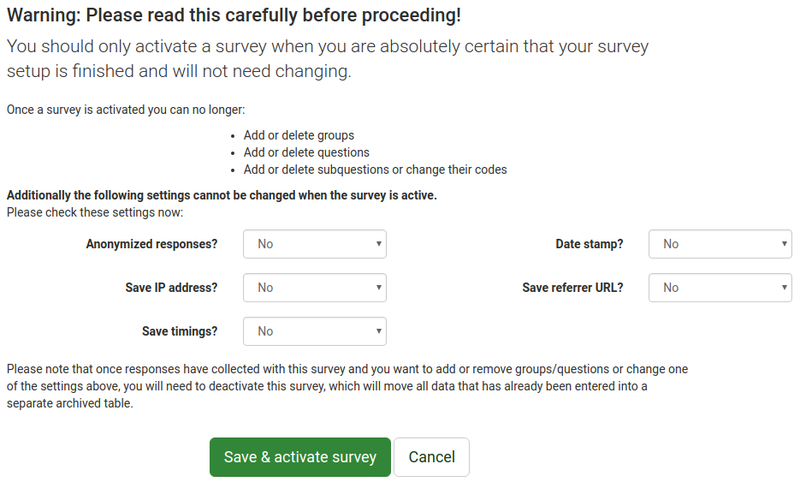 if you deactivate (not expire) the survey, it will move the responses to a backup table and lose participation information but you will again be able to add new questions and groups and modify survey parameters. If the Activate this survey button is disabled, then your survey is not yet capable of being activated (for example if you have no questions created yet). Once clicking on this icon, LimeSurvey will run a quick consistency check to make sure that your survey will work properly. This page was last edited on 15 November 2018, at 18:20.